Almost effortless sightings are thanks to small ships that can maneuver skillfully and quietly into less-frequented waterways to access remote bays, coves and shorelines preferred by Alaska’s “Fab Five”, a group in which guests of AdventureSmith Explorations have affectionately included whales, brown bear, mountain goats, moose, and King salmon. “Coastal Alaska is special. You just don’t see Alaska’s Fab Five in this concentration or magnitude elsewhere in the state. 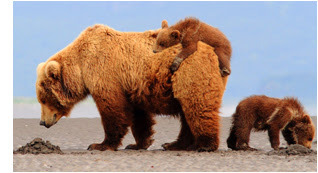 In my experience as a former guide, these are the animals that people come to Alaska to see,” explained Todd Smith, founder and president of this company that specializes in small ship cruises on yachts and expedition ships carrying as few as eight guests. He underscored that wildlife viewing aboard a small ship allows better silent access and more predictability over big ship, land-based, river or air viewing. While itineraries may focus on one or more of the Fab Five, oftentimes all five can be spotted along the course of a voyage. Shallow natural harbors accessible only by small ship encourage guests to hop into zodiacs, kayaks or even atop paddle boards to gain prime viewing and intimate encounters. Brown Bear - Alaska’s Coastal Grizzlies is an eight-day journey on the eight-guest converted research vessel Ursus. This cruise itinerary, the most remote the company offers in Alaska, forages for one of the world’s most formidable mammals, coastal grizzlies, in wilderness waterways (inaccessible to traditional cruise ships) of Katmai National Park. 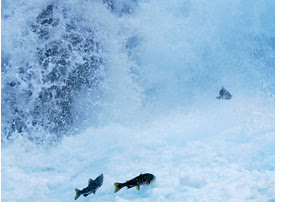 Guests absorb the drama of these creatures feeding on a summer’s bounty of spawning salmon. Ingesting more than 30 fish per day each, a male can weigh over 1,000 pounds and measure more than five feet standing. Gateways are Kodiak or Homer, with an included pre- and post-cruise hotel night, day boat tour of either Kodiak Island or Kachemak Bay and a scenic floatplane flight to and from the Ursus. The per person double rate is from $9,295. King Salmon - Sikumi Custom Alaska Cruise is a seven–day adventure aboard the eight-guest Sikumi. Guests can safely compete with shore bears in their own feeding grounds by fishing for King salmon right off the vessel. Common sights are whales, bears (brown and black), seals, sea lions, Dall’s porpoises and bald eagles. Note: the largest known King salmon ever caught weighed 126 pounds. Sikumi’s captains, formerly commercial fishermen, bring a high level of experience in the art of salmon fishing. The chef will showcase guests’ catch (accompanied by fresh-caught halibut, crab and shrimp) at dinner. Variations on the route and itinerary are offered with trips departing from Juneau, Petersburg or Sitka. The per person rate is from $5,950. 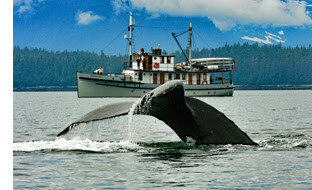 Whales - Inside Passage Catalyst is a seven-day program on the 12-guest Pacific Catalyst II through Southeast Alaska, exploring fishing towns, wilderness solitude, bear habitat, Pack Creek Zoological Reserve and glacial fjords. Frederick Sound is among the migratory humpback whales’ prime summer feeding grounds. These endangered animals may weigh over 35 tons and measure up to 50 feet long. Hydrophones onboard allow guests to listen to their songs. There are sightings of Orca, porpoise, Stellar sea lion and numerous sea birds. Seymour Canal, a 23-mile-long inlet, is home to the highest concentration of bald eagles in the region and a large population of energetic Dall’s porpoise. In a temperate rain forest are probable sightings of black and brown bear and mountain goats. This trip was featured in National Geographic Magazine's Top 50 Tours of a Lifetime. The journey begins in Juneau and disembarks in Petersburg. The per person rate is from $4,250. Moose - Glacier Bay Adventure Cruise is a six-day itinerary aboard the 12-guest Sea Wolf. The good news is that there has been a recent uptick in the moose population and May and June are preferred sighting months. 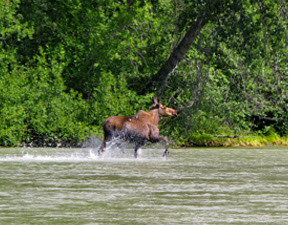 A bull moose can weigh in at 1,600 pounds but can stealthily fade into the wilderness. Wildlife encounters occur daily. A variety of birds are migratory in May as bear emerge from hibernation, nosing to the intertidal zone. Snow in the mountains makes the beaches a highway for wildlife in search of food. “We rarely saw wolves and now it is rare not to see them, and many times with pups,” says Sea Wolf Caption Kimber Owen. Guests embark in Bartlett Cove and Geike Inlet and disembark in Juneau. The per person double rate is from $3,700. Mountain Goat - Exploring Muir's Wilderness is an eight-day itinerary retracing some of the steps and sailings in Alaska’s Inside Passage taken between 1879 and 1890 by famed naturalist John Muir. Guests can choose the newly refurbished 84-guest Safari Endeavour or the 36-guest Safari Explorer. 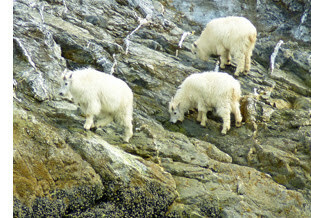 The glacially carved rock walls of Glacier Bay and the steep-walled fjords of Endicott Arm are home to mountain goat that follow the disappearing snowline that by mid-June brings the animals too high to be easily seen. Muir traveled to Alaska to prove his theory that Yosemite Valley was carved by glaciers, but he found so much more. 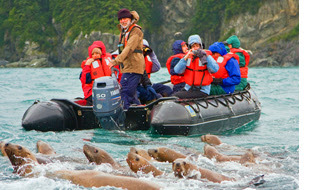 On this trip in Alaska, guests view spectacular tidewater glaciers and watch whales and bear in their natural habitat. This trip begins and ends in Juneau. The per person double rate is from $4,695. A full complement of AdventureSmith Explorations’ Alaska adventures can be seen online at http://www.adventuresmithexplorations.com/alaska. For information on all of AdventureSmith’s small ship cruises worldwide, itineraries, availability and reservations, Phone: 800-728-2875 toll-free or visit http://www.adventuresmithexplorations.com/.